Stain-Guarding uses a high-grade sealer specific to your stone or tile type. Sealing reduces the speed that your surface will absorb liquid, guarding against future staining by preventing contaminants from soaking in immediately, and will also allow easier maintenance of the surface. Tiles have different levels of porosity, meaning they are capable of soaking up different amounts of water or other liquids. 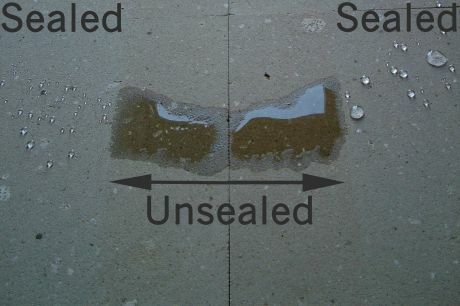 It is important to test your tile's porosity level to determine whether it needs sealing or not. Tile sealing is particularly useful on tiles that are porous, or that have open pore structures. However impervious tiles can also be sealed if problems are occurring with the grout surrounding the tiles. Even though we think of stone as 'hard', it is in fact a porous material that will absorb spills and stains if left untreated and unprotected. Stone surfaces are commonly used on bench tops, vanities and floors – areas that have high exposure to spills. Stain-Guarding to seal your stone will help prevent the entry of moisture and most stains – enhancing the beauty and life of this investment without affecting its look or finish. Stone sealing is particularly important on very porous stone, such as sandstone. Acid-sensitive stone (such as marble and limestone) can also benefit greatly from stone sealing. A wet look sealer gives all the benefits of sealing, but also darkens the colour of the surface by 2-3 shades – giving a permanent ‘wet look’ finish without affecting the texture of the stone. For more information on this option refer to the Surface Enhancement page. Sealing provides protection, but does not completely isolate the surface for damage. For the next level of protection, consider Barrier-Coat Polishing surface coating systems. Demonstrating how Tile Sealing works to keep any liquid on the surface, preventing it from absorbing immediately. Both sides have had a Tile Sealing treatment; the central part is natural.